This fact sheet presents estimates for 2017 of the contraceptive, maternal and newborn health care needs of women in developing regions, critical gaps in service coverage, and the costs and benefits of fully meeting these needs. A detailed methodology and data tables are available for this analysis. Corrected December 6, 2017. See note. As of 2017, 1.6 billion women of reproductive age (15–49) live in developing regions. 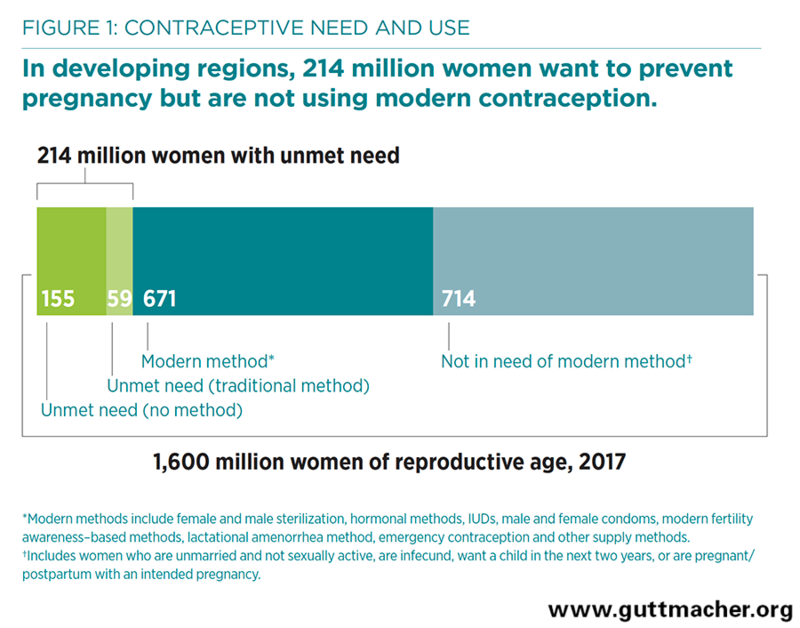 About half of them (885 million women) want to avoid a pregnancy; of this subset of women, about three-quarters (671 million) are using modern contraceptives (Figure 1). Yet 214 million women of reproductive age in developing regions who want to avoid pregnancy are not using a modern contraceptive method. This includes 155 million who use no method of contraception and 59 million who rely on traditional methods. These women are considered to have an unmet need for modern contraception. Their number has decreased from 225 million in 2014, as modern method use has increased. The proportion of women who have an unmet need for modern contraception is highest in Sub-Saharan Africa (21%), while the largest absolute number (70 million women) live in Southern Asia. Together, Sub-Saharan Africa and Southern Asia account for 39% of all women in developing regions who want to avoid pregnancy and 57% of women with an unmet need for modern contraception. Of the estimated 206 million pregnancies in 2017 in developing regions, 43% are unintended (that is, they occur too soon or are not wanted at all). 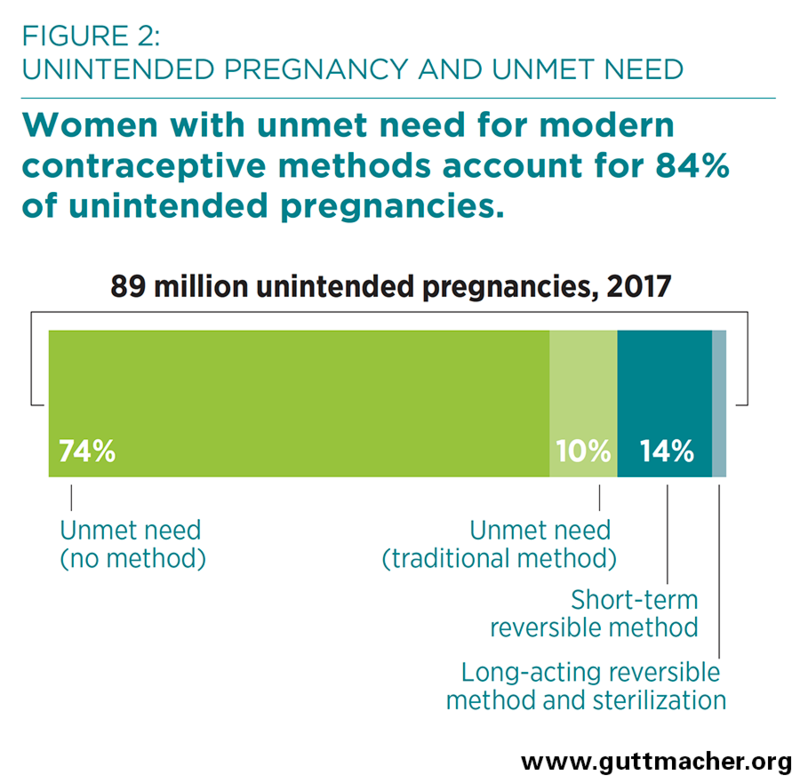 Women with an unmet need for modern contraception account for 84% of all unintended pregnancies in developing regions (Figure 2). Women using no method of contraception account for 74% of unintended pregnancies, while women using a traditional method account for 10%. Of the 127 million women who give birth each year in developing regions, many do not receive essential maternal and newborn health care. Overall, just 63% receive a minimum of four antenatal care visits, and 72% give birth in a health facility (Figure 3). There are wide disparities in maternal and newborn health care across regions. For instance, only 56% of women giving birth in Africa deliver in a health facility, compared with 91% in Latin America and the Caribbean. Disparities among countries in contraceptive and maternal and newborn health care follow economic lines. The proportion of women aged 15–49 whose need for family planning is satisfied with modern contraception is lowest (49%) in low-income countries, compared with 69% in lower-middle–income countries and 86% in upper-middle–income countries. 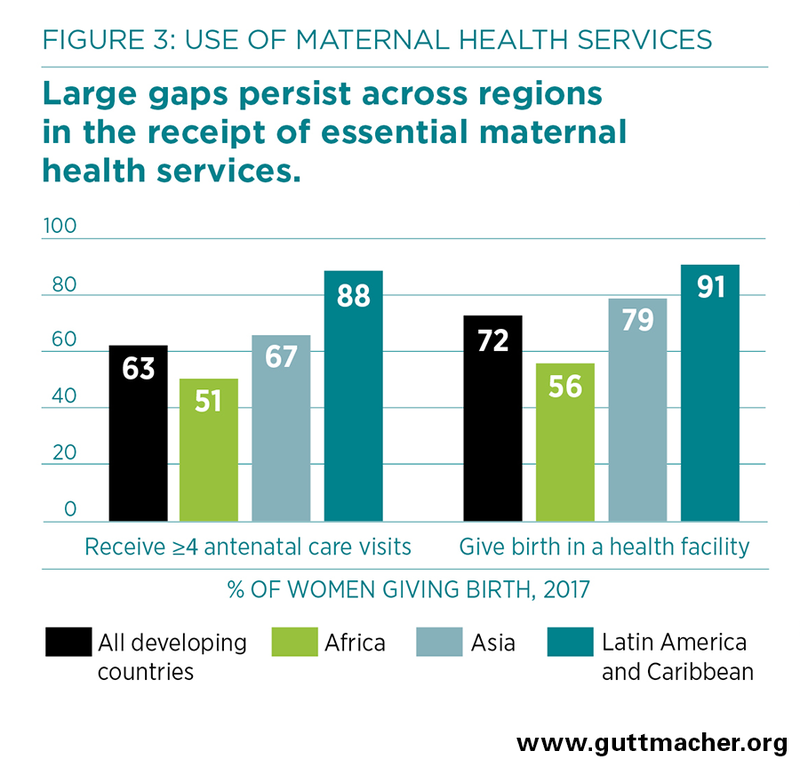 Likewise, the proportion of women delivering in a health facility is lowest (55%) in low-income countries and highest (94%) in upper-middle–income countries. Among women who experience medical complications during pregnancy or delivery, only one in three (35%) receive the care they or their newborns need. In 2017, an estimated 308,000 women in developing countries will die from pregnancy-related causes, and 2.7 million babies will die in the first month of life. 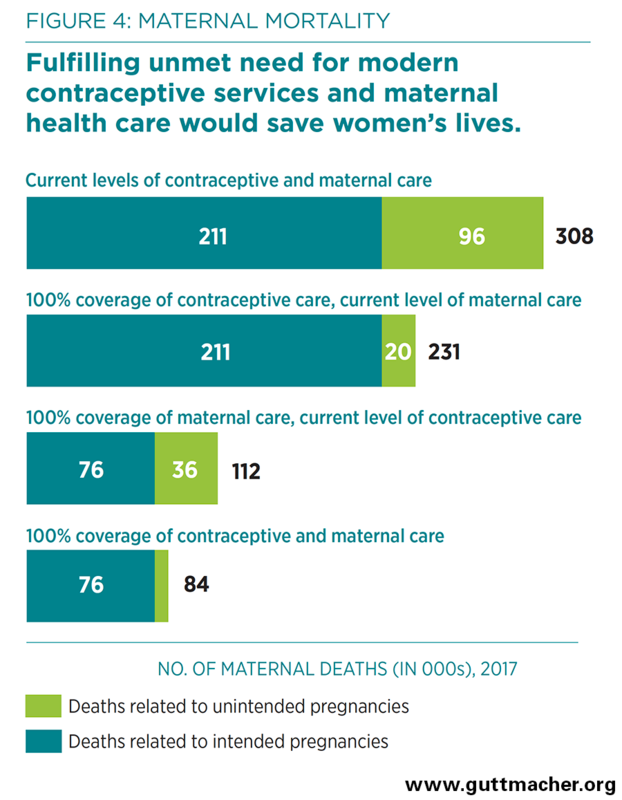 Most of these deaths could be prevented with full access to certain vital services: contraceptive care to help women avoid unintended pregnancies, and maternal and newborn health care to help mothers and newborns through pregnancy and delivery. Current modern contraceptive use prevents an estimated 308 million unintended pregnancies annually among all women of reproductive age in developing regions. If all unmet need for modern contraception were satisfied in developing regions, there would be approximately a three-quarters decline in unintended pregnancies (from the current 89 million to 22 million per year), unplanned births (from 30 million to seven million per year) and induced abortions (from 48 million to 12 million per year). The health benefits of preventing unintended pregnancies would be substantial. Compared with the current situation, fully meeting the unmet need for modern contraception would result in an estimated 76,000 fewer maternal deaths each year (Figure 4). Maternal and newborn health care, by which we mean services that cover pregnancy and its outcomes (live birth, miscarriage, stillbirth or abortion), currently prevents 198,000 maternal deaths and 1.8 million newborn deaths per year in developing countries. Providing all pregnant women and their infants with the level of maternal and newborn health care recommended by the World Health Organization would reduce maternal deaths by 64%, to 112,000 per year, assuming no change in contraceptive use or in the number of unintended pregnancies (Figure 4). Newborn deaths would drop by 76%, to 655,000. If full care for all pregnant women and newborns were combined with full provision of modern contraception to women who want to avoid pregnancy, maternal deaths would drop from 308,000 to 84,000 per year, and newborn deaths would drop from 2.7 million to 538,000 per year. The estimated current annual cost of modern contraceptive services in developing regions, covering 671 million women who are currently using modern methods, is $6.3 billion, including direct and indirect costs (Figure 5). This is one dollar per person per year in developing regions ($1.01). Expanding and improving services to meet all women’s needs for modern contraception in developing regions would cost $12.1 billion annually (including both direct and indirect costs), or $1.93 per person per year. Maternal and newborn care at current levels costs an estimated $25.7 billion annually, of which $17.4 billion is spent on care related to intended pregnancies and $8.3 billion on care related to unintended pregnancies. Fully meeting the needs for such care would cost $54.1 billion annually (or $8.65 per person per year). 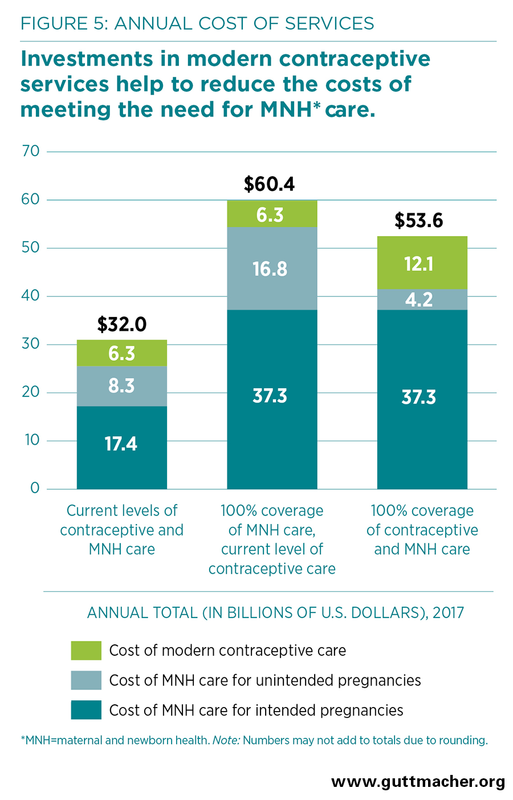 Because the cost of preventing an unintended pregnancy through use of modern contraception is far lower than the cost of providing care for an unintended pregnancy, for each additional dollar spent on contraceptive services above the current level, the cost of pregnancy-related care would drop by $2.20. Fully meeting the needs for both modern contraception and maternal and newborn care would cost $53.6 billion annually—$8.56 per person—in developing regions. Investing in both contraceptive and maternal and newborn services together results in a net savings of $6.9 billion compared with investing in maternal and newborn health care alone. An investment of $8.56 per person per year would help ensure that all women in developing regions receive essential maternal and newborn care and give women and couples effective means to prevent unintended pregnancies, time their births and have the number of children they want to have. Barriers to the provision of accessible and acceptable care must be tackled. These include policy restrictions, shortages of trained health personnel, poor-quality services, lack of outreach to marginalized groups of people, and social and economic factors that prevent people from obtaining or using needed services. Significant investment in contraceptive services and maternal and newborn health care is needed. Governments, donors, NGOs, households and individuals all need to contribute to closing the funding gap to improve and expand services. Investing in contraceptive services and maternal and newborn health care together, rather than in maternal and newborn care alone, saves money and has a larger impact in preventing deaths and improving the health and well-being of women and their families. The return on these investments goes beyond the critical impacts on health to include broad social and economic benefits for women, families and societies, such as increases in women’s and children’s education, increases in women’s earnings and reductions in poverty. To help decision makers evaluate the investments needed in developing regions, these 2017 estimates show the need for and costs and benefits of sexual and reproductive health services in two key areas: contraceptive services and maternal and newborn care, which includes the provision of antenatal, labor, delivery, postpartum and newborn care, and care for women who have stillbirths, miscarriages, ectopic pregnancies or induced abortions. For each key area, estimates are presented in this fact sheet for developing regions as a whole* and for major geographic regions. Estimates by geographic subregion and World Bank income group† and specific sources for data used in the 2017 estimates can be downloaded above. The 2017 estimates build on prior Adding It Up reports that provided estimates for 2003, 2008, 2012 and 2014. The 2017 estimates draw on new survey data and the most recent information on population and births, maternal mortality ratios, newborn mortality rates, maternal and newborn cause-of-death distributions, estimates of induced abortion and unintended pregnancy, guidelines for contraceptive and maternal and newborn health services, estimates of health worker salary costs, and commodity and supplies costs. Where relevant, we adjusted estimates to pertain to the 2017 reference year. The 2017 estimates include a limited subset of the services covered in the 2014 report; they do not include services to prevent mother-to-child transmission of HIV, to protect the health of pregnant women living with HIV, or to treat STIs among women of reproductive age. Estimates of abortion assume no change in the safety of abortion provision. For each of the broad groups of sexual and reproductive health services included in the 2017 estimates, results are estimated for the numbers of women of reproductive age (15–49) and their newborns needing these services, the levels of services they currently receive, health benefits that accrue from current services and that would accrue from meeting 100% of service needs, and the costs of current services and of fulfilling the unmet need for services (including the cost savings that would result from fully providing both contraceptive services and maternal and newborn health services, compared with maternal and newborn health services alone). Cost estimates (in 2017 U.S. dollars) include both direct and indirect costs. Direct costs are those related to personnel time, commodities and supplies for contraceptive services and maternal and newborn medical care, and information and counseling associated with these services. Indirect costs, also known as program and systems costs, are those related to program management, supervision and training of personnel, monitoring and evaluation, human resources development, transport and telecommunications, health education, outreach, and advocacy, infrastructure improvements, and health management information and commodity supply systems. *Per UN Population Division classifications, developing regions comprise Africa, Asia, Latin America and the Caribbean, and Oceania, excluding Australia, Japan and New Zealand. The 2017 estimates are based on data for 148 countries or territories, and estimates presented here for Asia include countries in Oceania. †Per World Bank classifications, low income corresponds to a 2015 GNI per capita of $1,025 or less, lower-middle to $1,026–4,035, and upper-middle and high-income to $4,036 or more. The analysis covers 96% of low- and middle-income countries: 100% of those that are low income, 98% of those that are lower-middle–income and 93% of those in the upper-middle–income category. Note: Changes were made to correct errors in the coverage of contraceptive and maternal health services and the calculation of cost estimates in Adding It Up: Investing in Contraception and Maternal and Newborn Health, 2017. None of these corrections change the study’s summary findings or conclusions. For details, see the errata at the end of the online supplementary tables (addingitup2017-supplementary-tables.xlsx), which can be downloaded above. This fact sheet is published as part of the study, Adding It Up: The Costs and Benefits of Investing in Sexual and Reproductive Health 2017, currently being conducted by the Guttmacher Institute. The research team is led by Jacqueline E. Darroch with support from (in alphabetical order) Suzette Audam, Ann Biddlecom, Grant Kopplin, Taylor Riley, Susheela Singh and Elizabeth Sully, all of the Guttmacher Institute. The study benefited from input from Eva Weissman, independent consultant, and Karin Stenberg, World Health Organization. The study on which this fact sheet is based was made possible by UK Aid from the UK Government, and grants from the Bill & Melinda Gates Foundation and the John D. and Catherine T. MacArthur Foundation. The views expressed are those of the authors and do not necessarily reflect the positions and policies of the donors.